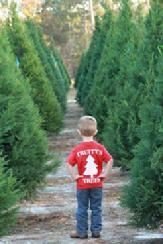 Truitt's Christmas Tree Farm is located in the Hodgeville Community in extreme southern Effingham County. The farm is located approximately one mile north of the intersection of Hodgeville Road and Goshen Road. From Savannah: Take 21 north towards Rincon and turn left onto Goshen Road. Stay on Goshen Road intil you reach Hodgeville Road. Take right and follow the signs.